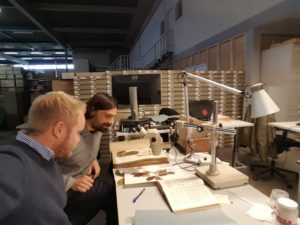 Yannick, together with Štěpán Janeček, spent the last week in the Netherlands by visiting the national herbarium of the Netherlands based at Naturalis and to visit the Hortus botanicus in Leiden. In the herbarium they were working on further identification of plant species from Mount Cameroon and cross-checking field determinations done during our expeditions. This visit was also an opportunity to meet Dutch Afrotropical botanists and to initiate closer future collaboration.